If you crave getting inked but don’t you don’t ready for a regular tattoo, or simply want to give your regular tattoo a twist, a black-light responsive tattoo might be the thing to consider. 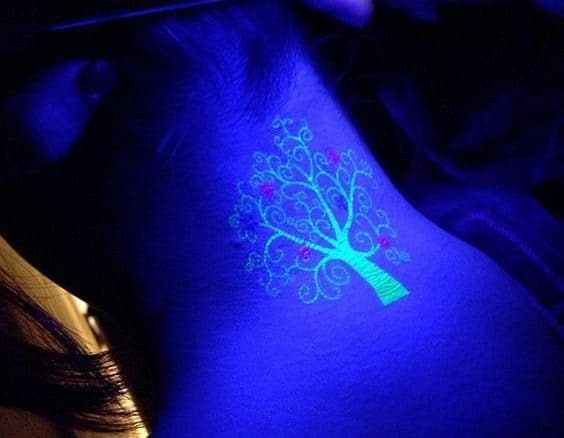 Otherwise called UV tattoos, they are only visible under black-light when they heal! The different types of glamorous glow in the dark tattoos (or, if we need to be more accurate – UV glowing tattoos) have become extremely popular among the young generation and those who pride themselves as high in setting trends. They are of various types, and they all use special tattoo ink which is of mixed components that enable them to glow when a person is in the dark. With these tattoos, nobody can know that a person has a tattoo until they step out into the darkness. In the ordinary light, they look like the regular tattoos if the person wearing has only highlighted the edges of the traditional dark ink tattoo using the glow in the dark ink (Wiki). As soon as the lights go off, the tattoo automatically begins to glow. On the other hand, if the wearer has a brand new tattoo made using the glow in the dark ink on its own, then nobody looking at it in the normal light would notice the tattoo. The task of acquiring or drawing the glow in the dark tattoos is similar to that of the classic tattoos, but the difference is in the ink. They are not prevalent in most tattoo galleries and shops, especially because not all countries have Okayed their use as quite a number of people have difficulties with their skin adapting to them. In some countries like the US and other Western countries, the ink is imported from other countries overseas. The artist working on this tattoo must use the black light to be able to see the way forward. The tattoos glow or shine bright when a people are in nightclubs where they switch off the normal lighting and use other lights like disco lights. Nowadays the glow in the dark tattoos is the craze for with party animals. It is because most people regard it as being exclusively for partying and clubbing as they can go the whole day moving around people who would not see the tattoo because it only shows at night in the dark. Their main interest is in waiting till the time comes to hit the night spots. In the nightclubs, they enter the darkness to reveal and show off their unique designs. Those who see these tattoos in the dark say they carry striking designs that are not common with the classic or ordinary black ink tattoos. The clubbing tattoos are not about to compete with the ordinary tattoos during the day, because the wearers are happy to go about their business as if they do not have any. The enthusiastic partying crowd of night club goers loves the tattoos because it adds to the fun when they suddenly flush their hitherto concealed artwork in the night. The fact that glow in the dark tattoos is generally invisible during the day as they cannot be seen in normal daylight helps those who have them to conceal them easily. They do not have to hide them under clothes in case they are discouraged in places where they are not expected. 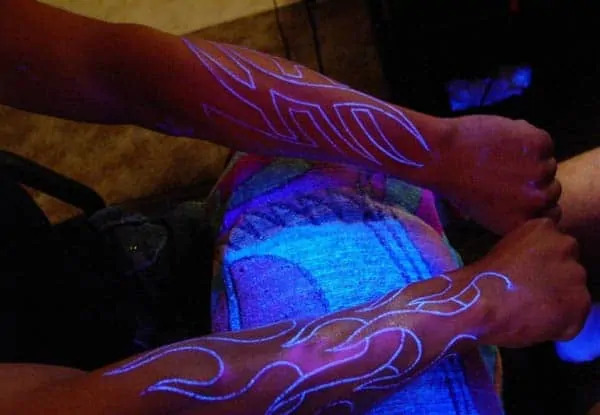 This surprise factor that accompanies the glowing tattoos is the main attraction for most people who like to flush them at unsuspecting crowds of friends who get amazed at the sudden appearance of the glowing design in the dark. It is perfect for sizzling up night life and introducing some fun at night parties.